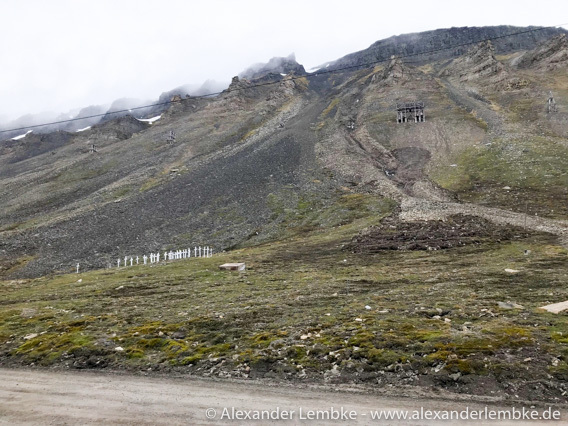 Way 300 in Longyearbyen was closed for all traffic after a landslide close to the cemetary. This road connects Skjæringa (the part of Longyearbyen where church, Sysselmannen etc. are located) and Huset. The Sysselmannen has now opened Way 300 again for pedestrians and bicyclists. Motorised traffic is not permitted. This is valid until further notice from the Sysselmannen. Landslide in Longyearbyen near the cemetery: now way 300 is open again for non-motorised traffic. Image © Alexander Lembke.